Thoughts: Your real life. "I will start tomorrow" - you will never start tomorrow! This is an excuse to avoid what ever is going on NOW! And if you 'screw' up in this moment, who's to say you can't re-create yourself anew in the next moment and start again! We can always start again now, and now and now and now! We are never one way - always changing - we are nothing and our word. I am nothing and my word. If I say I can I can, if I say I can't I can't. Forgive yourself - you are the only one who will do it for you! And as Mother Teresa says 'Life is a struggle - accept it'. Jinjee Talifero a beautiful being and creator of The Garden Diet says "Your real life is waiting for you! It is already there! Here! It is not something you need to strive and work for or envy others for. Your have your very own! 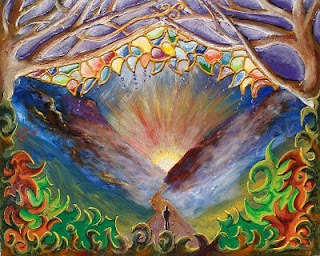 A totally unique life, with its own challenges and joys, woven from the fabric of life by your individual ancestry, environment, choices, beliefs, and the desires of your heart, a life that is rich with meaning, that is a profound story, and that reflects your deepest values. Yet so many little things can keep us from embracing our life, from living this wonderful life fully, from experiencing the stark reality of our breathtaking existence! One way Jinjee has found to overcome these and other addictions is with a raw vegan diet, regular exercise and a conscious pursuit of inner balance and harmony. Meal 1: A pineapple and mint juice :) Freshly juiced of course mmm! Meal 2: 2 organic nectarines. Meal 3: Creamy Coconut Balls! Created from honey, lemon, cashew nuts, oats, coconut and vanilla! Meal 4: A Mango Avocado Salad. 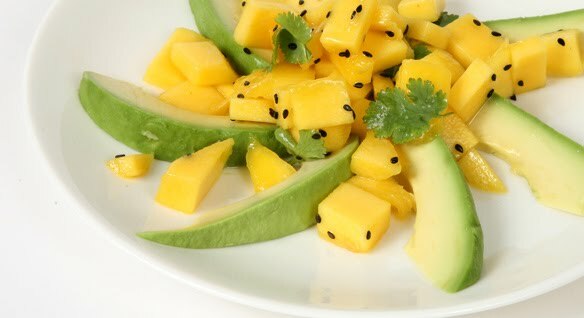 Created with mango, avocado, olive oil, the juice of lime and tangerine, fresh coriander (cilantro) and black sesame seeds! Meal 6: Sweet Sesame Salmon Salad. 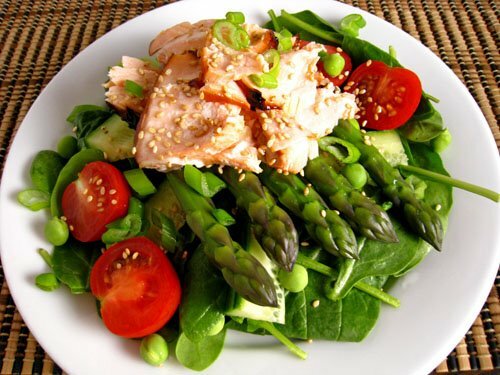 Created with salmon, honey, sesame seeds, aspargus, cucumber, baby spinach, tomatoes and spring onions (shallots)!